Israeli soldiers abducted, on Monday at dawn, three Palestinians, including a father and his son, in Bethlehem and Salfit governorates, in the occupied West Bank, and injured a young man. 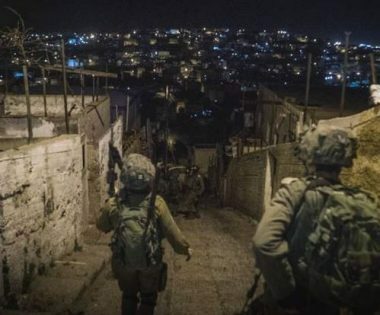 The Bethlehem office of the Palestinian Prisoners’ Society (PPS) said the soldiers invaded the Saff Street, in the center of the city, searched homes and abducted Anas Mohammad Abu ‘Ahour, 22. Also in Bethlehem, the soldiers shot a young man, 20, with an expanding bullet in his left leg, before he was rushed to a local hospital. The Palestinian was with several other workers when he was shot in Wad al-Hummus area, near Al-Khass and an-No’man villages, east of Bethlehem. The soldiers also invaded Qarawat Bani Hassan village, west of Salfit, searched a few homes and abducted a father, identified as Amin Mer’ey, 60, in addition to his sons, Mustafa and Abdul-Rahman. The father also has four other sons, who were abducted by the soldiers in previous invasions, and are still imprisoned.